Flaming object streaking across the sky releases escape pod over Santiago, Chile? The following footage of a strange moving flaming object was caught on camera by Francisco Garcia on September 25, 2017 19.30 local time over Santiago, Chile. While the object streaking across the sky it suddenly releases something what looks like an escape pod sparking theories that it could be a UFO. 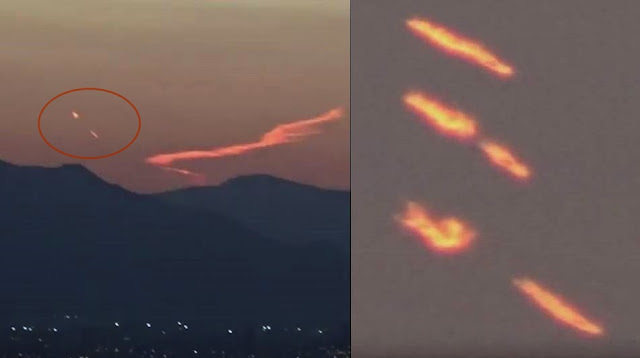 Others suggest that the flaming object is the effect of a large plane as it’s cuts through a cloud layer but I’m not sure if that is the case because it does move in a way that doesn’t suggest clouds. So, the object is a UFO ejecting an escape pod or is it more likely that the object is something like a meteorite, space junk or a man-made reentry vehicle reentering the atmosphere and breaking up?